On Tuesday, May 2nd, MSU’s Department of Anthropology, Department of Infrastructure Planning and Facilities, and the Office of the President received the Michigan Governor’s Award for Historic Preservation and a special tribute from the State of Michigan Legislature on behalf of MSU Campus Archaeology. 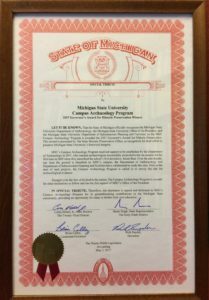 The award was given for their combined efforts to preserve the cultural resources found on Michigan State University’s campus. 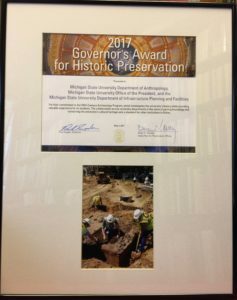 This award, sponsored by Michigan’s State Historic Preservation Office and State Historic Preservation Review Board, recognizes individuals, companies, and institutions that strive to protect, preserve, and study the many historic resources within the state of Michigan (For a complete list of those who received the Governor’s Award for Historic Preservation this year, click here). Poster highlighting CAP’s work on display at the award ceremony. 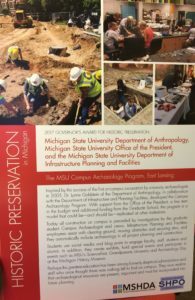 In the future, Campus Archaeology will continue to work toward preserving and understanding the history of our small slice of the state of Michigan, despite a political climate that is increasingly antagonistic toward cultural and natural resource management and preservation. Preservation, when done properly, helps to build a stronger sense of self and identity for neighborhoods, regions, and even nations, which can act as guiding principles for future action. The preservation of buildings and archaeological sites also provides stark physical reminders of who we are, where we came from, and what we strive to become in the future. They remind us of how much we have achieved, but also how far we have left to go. Further, monuments and other preserved sites allow us to interact with and experience our heritage, or the heritage of others, in a way that cannot be reproduced through other means. Beyond this cultural and social value, preservation efforts also generate economic opportunities by creating jobs, increasing tourism, increasing property values, and attracting businesses who want to benefit from this improved traffic. Most importantly, these resources are non-renewable; they cannot be reclaimed once they are gone, so we must work to preserve them now before they are lost forever. 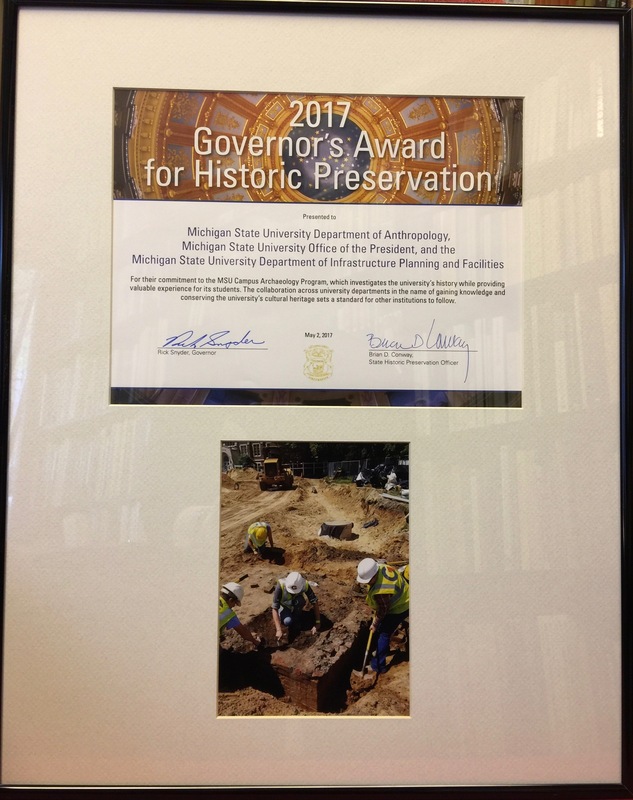 We congratulate all of the current and previous winners of the Michigan Governor’s Award for Historic Preservation for their great work, and we hope they continue this work far into the future.